Nantucket Book Festival attendees lucky enough to find a seat in the Dreamland Harborview Room on Friday morning, June 16, were in for a treat. Authors Laurie Halse Anderson and Nat Philbrick, who had never met before, were paired together to discuss their recently published books, written for children and young adults, about the American Revolution . What followed was an hour of lively banter, laughter, and new insights into history, the art of writing, and the experiences of these two exceptional authors. 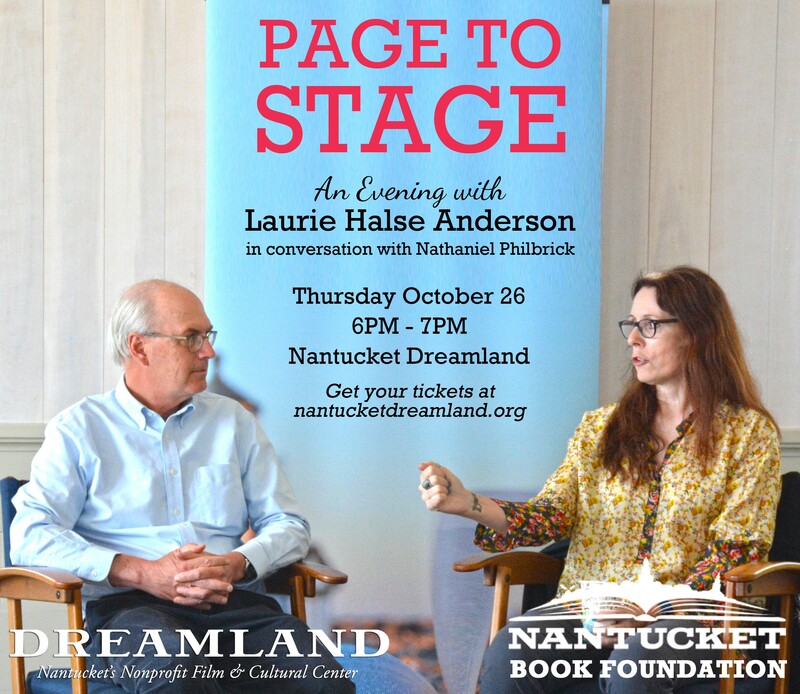 The Nantucket Book Foundation is thrilled to bring Laurie and Nat together again at the Dreamland's Page to Stage event on Thursday, October 26, at 6:00 PM. Laurie, in conversation with Nat, will be sharing the stories behind her wide range of literary works, including The Seeds of America Trilogy (Chains, Forge, Ashes). Chains was a finalist for the National Book Award; Kirkus Reviews called Forge "the best book you'll ever read." Laurie's most famous book, Speak, also a National Book Award finalist, tells the story of a teenage girl and the sexual assault that renders her silent. The Nantucket Book Foundation gave a free copy of Speak to every high school student as summer reading; Laurie will be talking with those students earlier on October 26, as well as presenting to the elementary and middle schools about her other titles such as The Hair of Zoe Fleefenbacher Goes to School (for our younger students) and The Impossible Knife of Memory. Page to Stage: Laurie Halse Anderson in Conversation with Nat Philbrick on Thursday, October 26 at 6:00 PM is open to the public, but seating is limited. Tickets are $25 and are available by clicking here . Proceeds will benefit the Dreamland's Children's Theatre program and the Nantucket Book Foundation's year-round work with our island's students. Don't miss this opportunity to enjoy an hour of fascinating conversation between two of our favorite authors.